There are many benefits of miso soup. This is a healthy and nutritious soup that is often suitable for people who lead a vegetarian or vegan lifestyle. Miso is a seasoning that is made using fermented rice, barley, soybeans and salt. Miso is a paste used to make soups, stew and sauces. There a wide variety of different types of miso, each has its own distinctive taste. The range of tastes reflects the way that the miso has been produced as well as the ingredients. One popular way of using miso is to make a healthy soup. What Are the Benefits of Miso Soup? The claimed benefits of miso soup are far reaching. Miso is said to offer benefits that range from reducing and slowing the signs of aging, through to aiding digestion and countering high blood pressure. Miso is low in fat and calories which makes it a useful ingredient for people who watch their food intake. Two teaspoons of miso contains 70 calories which when added to boiling water, makes a healthy and low fat hot drink. Miso is also reported to offer important benefits to vegans and vegetarians. Miso contains B12, which is an essential nutrient that is sometimes lacking in a vegan or vegetarian diet. Miso is also high in protein and this makes it an extremely versatile ingredient. 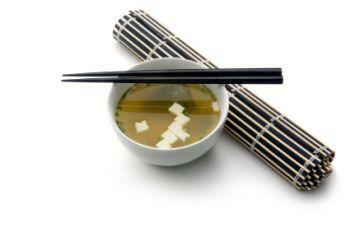 A bowl of miso soup can provide many essential nutrients to help support a vegan or vegetarian diet. Note: Miso is also high in sodium. This is something that people who monitor their sodium intake should be aware of and watch carefully. Is Miso Soup Vegetarian or Vegan? While miso is suitable for vegetarians and vegans, people should be aware that traditional miso soup is not necessarily going to be vegan or vegetarian. Traditional miso soup is prepared using dashi, which is a fish stock, or contains other ingredients such as chicken or fish. This means that soup made this way is not suitable for vegetarians and vegans and is something to watch out for. It is important to check the ingredients before ordering or buying miso soup. There are plenty of stocks that can be used as a substitute for dashi. Chinese mushroom stock, for instance, has a fragrant taste that complements miso. There are other ways to receive the benefits of miso. It can be used as a seasoning for other dishes. Seitan, for instance, can be boiled in miso or tofu can be marinated in a miso sauce. Miso is a surprisingly versatile ingredient and is beneficial to both vegetarians and vegans.